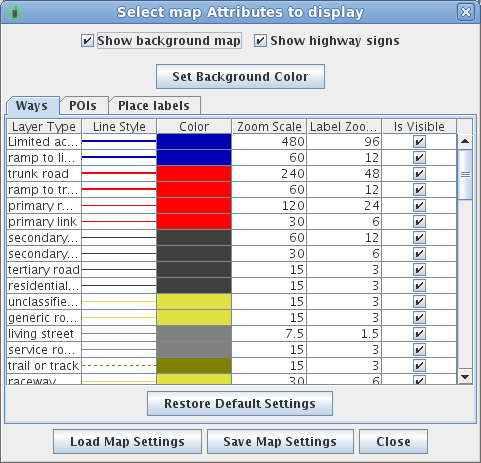 This sub-menu of the View menu enables and disables various layers of the map display, so the user can display only the information of interest. Note that stations and objects are filtered by the Filter menu. enable/disable showing the latitude/longitude graticule	(grid). enable/disable displaying range circles around transmitting	stations. enable/disable displaying track stripes along the recorded travel path of all moving stations. enable/disable displaying dead-reckoned positions of moving stations without a current position message. This dead-reckoning only continues for a user-configurabled period of time, specified on the expert-mode configuration dialog's Preferences tab. Note that it is probably advisable to turn off the position ambiguity areas when analyzing omni-DF station reports, as the circles may blend together, making it difficult to determine the coverage and heard signal strength for any given omni-DF station. enable/disable displaying the age (time since last received packet) underneath each station's callsign. enable/disable displaying the bearing and speed of underneath each mobile station's callsign. Note that for US NWS zone boundaries to be displayed, you will need to download the county and marine zone shapefile sets from the National Weather Service website at https://www.weather.gov/gis/AWIPSShapefiles and unzip the zip files into your configured tile directory. enable/disable displaying the Aloha circle (maximum coverage range that would saturate the communications channel). Note that if you have more than 1 RF port (such as for a cross-band digipeater, multiple Aloha circles will be displayed (one for each RF port), based on the traffic heard through each port. 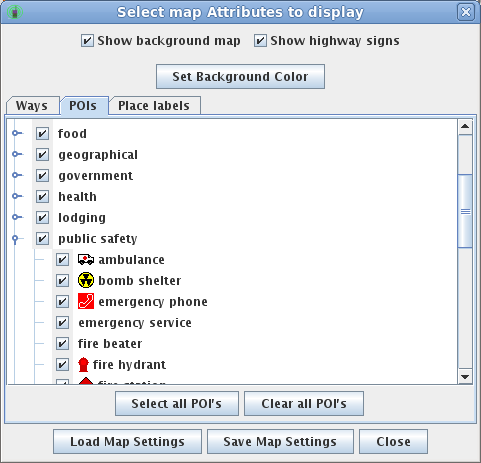 enable/disable displaying position ambiguity areas behind limited-accuracy positions, using a translucent version of the most common color in the symbol icon. This layer and the DF (direction finding) layer should not both be on when analyzing omni-DF stations. draw the symbols for stations and objects double-sized (to make it easier to find them on the map). draw the digipeat hop paths between packet-originating RF stations and the local station (note this only is meaningful and works only for packets received from RF by the local station, not via the Internet). display "killed" objects and items after their kill times, or only currently active objects/items. use the locally defined aliases (such as tactical callsigns) for stations and objects instead of the actual callsign or object name; when aliases are displayed on the map, they are displayed in blue (rather than the black text used for station license callsigns and object names). 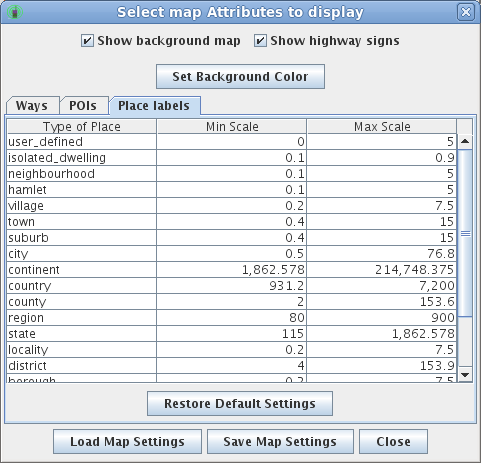 and geographic labels of regions and points in the map, such as city and country names (specifying the zoom levels between which each level of political hierarchy will be labelled). selectively enable drawing terrain elevation either as color-coded background and/or contour lines. The colors and thresholds for color changing of terrain levels can also be customized.